The timing chain is spun by the crankshaft sprocket which in turn moves the camshaft which opens and closes the valves. 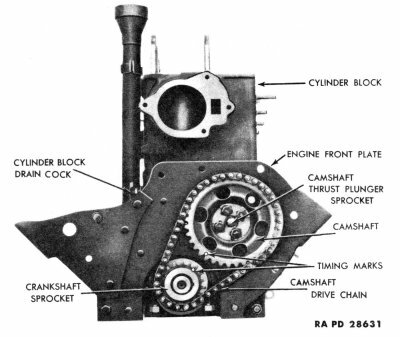 When installing the timing gears turn the camshaft sprocket until the punch mark on the camshaft sprocket is opposite the punch mark on the crankshaft sprocket (fig. 40). From TM 9-1803A Engine and Engine Accessories, Willys Overland Model MB and Ford Model GPW 1/4 Ton 4×4 Technical Manual .